Do you know who your best source of clients is? You should. Your best source of clients are your current--and former--clients. Clients who you've worked for before are an overlooked marketing tool for freelancers. When you've done a good job for an editor, private client, or corporate contact, he is (presumably) happy with you and your work. That means he's a potential walking advertisement for you. So let me ask the tough question: do your clients send potential clients your way? Do they think of you when someone they know is looking for a writer? Have you even asked your clients to refer you or give you leads? I suggest you get in the habit of asking your regular clients for referrals. I don't hit up a regular editor for work all the time, but when I'm getting slow, I'll mention that I'm actively looking for new work and ask her to keep me in mind for referrals. When I complete an assignment for an editor who's new to me (and she's accepted it), I'll ask if she knows of other editors looking for freelancers. For a ghostwriting client, when I finish a book, I'll ask if he knows of any other would-be book authors looking for a ghost. No, I can't expect my clients to do all of my marketing for me. Depending on where you are in your freelance career, and the type of work you do, you can expect to spend 20 to 90 percent of your time marketing your business. But looking to satisfied clients for leads and referrals should be one of your go-to freelancing strategies. **I'm excited to announce that in June I'll be participating in the 2014 Freelance Success/Word Count Blogathon. I commit to blogging every day for 30 days, along with 50+ bloggers on a variety of topics. I'm already putting together a list of topics but if you've been wanting me to cover a specific topic here (and I'm already considering the ones readers suggested here), comment below and I'll see what I can do! Goodbye, Byline is Now in Print--Get Your Copy Now! Well, last year I updated and expanded the book, including new templates, new rate information, and new advice and strategies from successful ghostwriters, content marketing writers, and other successful freelancers. It's been selling steadily on Kindle (don't have a Kindle? Get it on Smashwords here) but I know there are are readers like me who prefer the "real" thing--the print version. It will be available on Amazon shortly, but if you can't wait for your copy, buy it here. And stay tuned for more posts on marketing yourself as a writer, regardless of what types of nonfiction you write. **See how simple an effective follow-up is? It should take you less than 10 minutes to send, and should provoke a response. If you don't receive one, then find the next market that may be interested, and move on. Your pitches won't do you any good on your hard drive. Want to see more templates? One of the reasons Dollars and Deadlines: Make Money Writing Articles for Print and Online Markets and Six-Figure Freelancing: The Writer's Guide to Making More Money, Second Edition are so popular with readers is that they both include more than a dozen templates--real-life queries, LOIs, sample contracts, and even examples of what to say when contacting a potential source, for example. 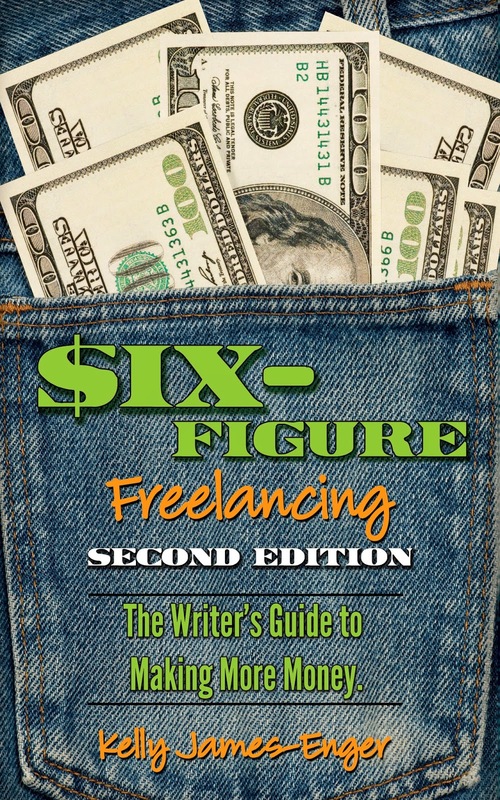 Well worth the money--and if you don't have a Kindle, you can pick up electronic versions (Dollars) (Six-Figure Freelancing) at Smashwords here. "How to be a Freelancer and Still Pay the Rent: Tips from the Trenches on Expanding into New Markets" will include a panel discussion featuring freelancers (including me!) who will share their successes and setbacks, plus offer advice on how to break into a wide variety of writing markets beyond mainstream and trade journalism. I'm looking forward to participating and to hearing the other panelists' tips--I plan to come home with a slew of ideas and ideas I can immediately put to you, and think you'll be able to do so, too! Let me know if you plan to be there, and please spread the word to your freelancing buddies! Thanks and I hope to see you soon. Hey, did you miss last week's post about how to get a free copy of Goodbye Byline, Hello Big Bucks? It's a $14.95 value and has everything you need to get started in ghostwriting and content marketing. Post a comment and you're likely to win, considering only one person has done so! Hope to see more comments soon. Reviews Sell Books--and How to Get a Free Copy of Goodbye Byline! to learn more about ways to sell my books through Improvise Press. Dollars and Deadlines: Make Money Writing Articles for Print and Online Markets. As I write this, Goodbye Byline has only two reviews. (Sad face.) My goal is to have 10 reviews by end of the month, and that's where you come in. 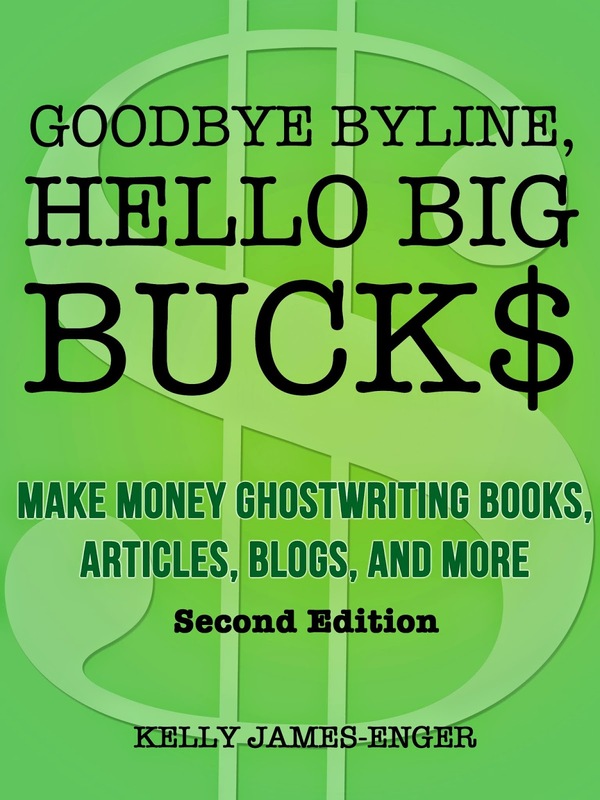 Post a comment here with a freelancing question, and you'll be entered to win a PDF of Goodbye Byline, Hello Big Bucks. All I ask is that you review Goodbye Byline by month's end. If you've wanted to learn more about ghostwriting (including content marketing), here's your chance. You'll learn how to get started, how to find clients, how to work efficiently as a ghostwriter, and how to avoid common ghostwriting pitfalls--and find templates of everything from LOIs to contracts to permission forms. So post your comment below, and stay tuned to see if you're a winner! So I thank veteran writer Caitlin Kelly for today's guest post. Kelly has also written for Cosmopolitan, Marie Claire, Smithsonian and More and is the winner of a Canadian National Magazine Award. She blogs at www.broadsideblog.wordpress.com, with more than 10,200 readers worldwide. She's the author of Malled: My Unintentional Career in Retail and Blown Away: American Women and Guns. For many ambitious writers, a New York Times byline may seem a distant dream. But for those of us who frequently write for the Times -- my byline appears usually once or twice a month, writing for them since 1990 – it’s a market worth breaking into. A Times byline offers serious journalistic street cred, prestige, and guaranteed visibility among assigning editors of books, magazine,s newspapers and digital media, most of whom read that newspaper every day. The paper also shifts gears fairly often, with freelance opportunities arriving and departing as editors internally shift responsibilities. If you read the paper carefully and often, you’ll be able to spot these and jump quickly. 8) You won’t be paid until your story runs, even if it is held for weeks or months. They pay by direct deposit, and usually within a few days or week of publication. They need copy! Whether a meaty feature for Sunday Business – 2,500 words or more – or a feature for Dining or Homes or Styles, Times editors rely heavily on a team of talented, trust-worthy freelancers. Pay varies widely, but can reach $1/word, usually more for their magazines, T and The New York Times Magazine. This is a smart, worldly crowd. They know their stuff and expect you to know yours as well. They need writers who won’t let them down. If you’ve done terrific work for one section and editor, that internal reference will be useful when introducing yourself to another one there. Having worked for three big daily papers as a reporter, The Globe and Mail, The Montreal Gazette and the New York Daily News, I love writing for newspaper editors. They’re clear and straightforward and, once they know you’re solid, are usually happy to work with you again. ****Want more of Caitlin Kelly's insights about smart reporting and writing? She is offering six 90-minute webinars May 10 and 17th by Skype: blogging, thinking like a reporter, personal essay, freelancing, developing ideas and interviewing. She's helped satisfied students from all over the world. Please visit caitlinkelly.com for details. This morning, I was a guest at the Freelance Writers' Roundtable, on the topic of six-figure freelancing. If you missed it, check it out here on YouTube. We talked about working more efficiently; what to say when you contact a source; ways to overcome interviewing fears; and why it's smart to create a writing specialty, among other things. Enjoy!